In its July 3 blog about 2012 SPx Football Shadowbox Slots cards, Upper Deck stated that, "As Upper Deck's innovations are frequently copied by other manufacturers, the company has a patent pending for this new type of trading card." Emphasis by Upper Deck on "patent pending." Having a patent license, being a patent litigator, and knowing my way around the United States Patent and Trademark Office (USPTO) website, this piqued my interest. So, I decided to track down this pending patent application. I figured it might be fun to write a piece analyzing it because patents are written in the language of patentese, which is anything other than self-explanatory. Unfortunately, the new Upper Deck patent application is apparently too new to be publicly available. Legal translation: The USPTO does not publish patent applications and make them available for the public to view until they've been pending for 18 months. Luckily, however, Upper Deck just had another patent issued, and it does a great job of showing just how complex patentese is. On July 10, Upper Deck was issued a patent entitled: Trading card game including trading card having a selectively unexposed section. Now, most games are catered toward kids. This implies that for kids to play, the game would need to be easy to comprehend. So, given that in my job I litigate patents, I should be able to take seven minutes to read, understand and explain how Upper Deck's invention works. Legal translation: I have been humbled by a kids game. The meat of any patent is the claims, so that's where I always start my analysis. 1. A trading card game for use by a first player and a second player, the trading card game comprising: a first card that influences the outcome of at least a portion of the trading card game, the first card including only one section; and a second card including a first section and a second section, the second section being slidable relative to the first section so that the second card moves between a first position wherein a portion of the second section is substantially unexposed to the players, and a second position wherein the portion of the second section is exposed to the players, the second section including (i) a first side having a first indicia that influences the outcome of at least a portion of the trading card game when the first indicia is exposed to the players, (ii) a second side opposite the first side, the second side having a second indicia that is different than the first indicia, the second indicia influencing the outcome of at least a portion of the trading card game when the second indicia is exposed to the players, and (iii) a grip region that is exposed when the second card is in the first position, the grip region having a thickness that is different than the portion of the second section; wherein the first card is positioned remotely from the second card so that the first card does not contact any portion of the second card at any time. Legalese/Patentese translation: Blah-blah, boring-overly technical language…influences the outcome…blah blah…slidable…more mumbo jumbo... zzz…. I can honestly say, I've never read a more boring sentence (yes, it is all one sentence). And I’ve read a lot of boring legal mumbo jumbo in my time. You’d think that any sentence with the phrases "slidable," "exposed to the players," and "grip region having a thickness," it wouldn’t be boring. Thanks to patentese it is. Legal translation: It's a kids game. Get your head out of the gutter! All I make of this claim is that it's a two-player card game, and something slides and that means something. And something doesn't touch something else. Yeah, that doesn't help either. The first player region 18 can include a plurality of zones. For example, in this embodiment, the first region includes a first zone 24A, a second zone 24B and a third zone 24C, although any number of zones can be included in the present invention. The zones 24A-C can be designated by different colors, numerical values, geometric shapes or any other suitable designation. Each zone 24A-C can be energized to varying degrees depending upon the number of cards 12, 14 positioned within each zone 24A-C. In one embodiment, the greater number of cards 12, 14 within a particular zone 24A-C, the higher the energy of that zone 24A-C. For example, at the outset of the game 10, two first cards 12 can be placed in each zone 24A-C, but this total typically changes as the game 10 progresses. Whenever energy is added, a first card 12 is placed facedown in the appropriate zone 24A-C. I give up. Maybe it's because I missed the whole trading card game phenomenon, but I don't get it. Honestly, since this has nothing to do with sports cards (at least I think it doesn't because "sports," "baseball" or "football" don't appear anywhere in the patent), I'm not going to spend more than seven minutes looking at this patent. So, congratulations Upper Deck on getting a patent! I hope the instructions with the actual game are more clear, though. What I can tell you after my seven-minute review is that the patent claims priority to a January, 2005 application. Legal translation: This bad boy has been in front of the USPTO for over seven years. That goes to show two things: 1) It's an important patent to Upper Deck and 2) the USPTO moves at a glacial pace. So, I don't feel so bad. It took the USPTO seven years to figure out that this invention is patentable. My seven minutes are nothing. And don't worry. 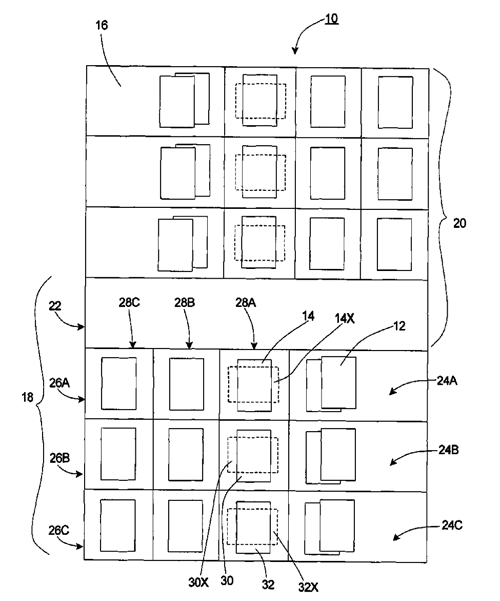 When the Shadowbox Slot patent application is published, I'll spend more time on that one. If you want to tackle the patent yourself, here's the document.